For a few months now, Hobbico has been teasing the RC masses with sneak peek videos of their new release. Vague, super sci-fi looking videos tantalized fans, but cut to the end before any real info was revealed. Well, the news is out and the Nero is about to hit the streets. We, at RC Driver, heard about the truck quite a while ago, but were not made privy to exactly what the details would be. We knew it was going to be big, but that was about all. Since its arrival at our offices, we got to really dig into it and see what it was all about, so let’s take a look and break it down as best we can in the limited space we’re allotted. Diff Brain … two words, but they mean so much more. What is it you ask? Well, I’m no scientific type, but essentially, it allows for the use of three different diff locking servos through a single channel on the Tactic TTX330 radio. That’s right, no multiple knobs for this diff and that. One, CLEARLY LABELED (so you know exactly what mode you’re in at a glance) knob that controls all four driving modes! Speaking of driving modes, you get four of them courtesy of this Diff Brain. 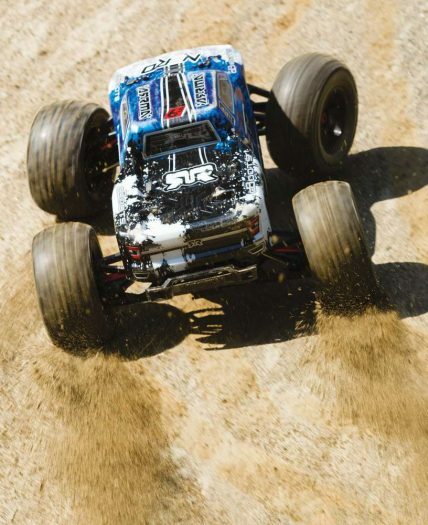 Blast mode is for all-purpose running with all the diffs unlocked, as you would do with any Monster Truck. Wheelie mode locks up the center diff so that the power is equally distributed to the front and rear diffs, even when the front wheels are off the ground. 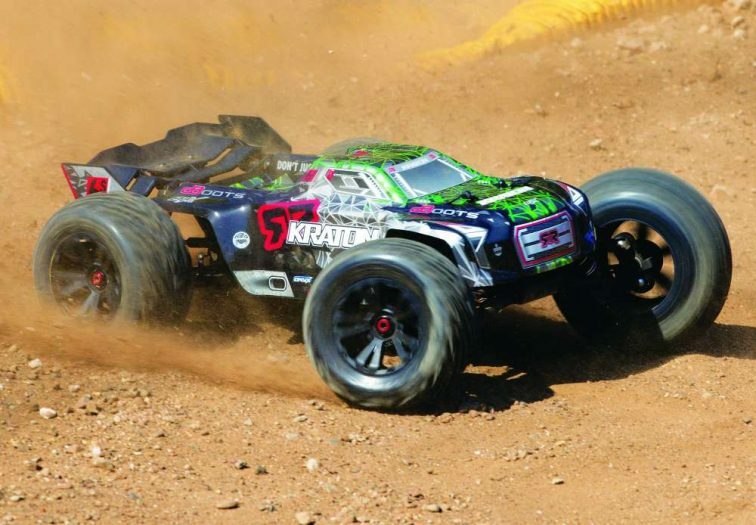 Drift mode locks the rear and center diffs down for some sweet sliding action on loose dirt or asphalt surfaces coated with a layer of sand and dust. Finaly, Climb mode locks up all three diffs for the ultimate in traction while traversing piles of rubble, stones or logs at lower speeds. Add to the mix that the Nero is capable of speeds exceeding 60 mph on 6S power and is fully waterproof and you’ve got yourself one heck of a recipe for fun! 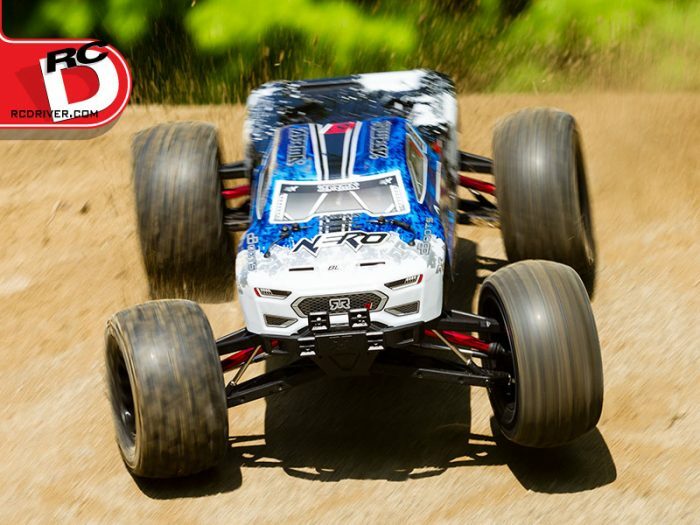 At RC Driver, we had first heard rumors and saw early renderings of the Arrma Nero a little over a year ago on our annual pilgrimage to Champagne, Illinois. The folks at Hobbico weren very excited about this soon-to-be beast, even in that early stage, and at this point it’s clear why they were so pumped. This truck is massive, it looks intimidating (especially with the body off), it boasts a series of innovative design features and is capable of some serious power. Toss in the fact that it’s fully waterproof and capable of speeds up to and over 60 mph and you’ve got yourself the perfect machine for those looking to bash on a serious level. Add to that the fact that you can Blast, Wheelie, Drift or Climb in the four distinct driving modes and you’ve got four vehicles in one to suit any driving style or need! 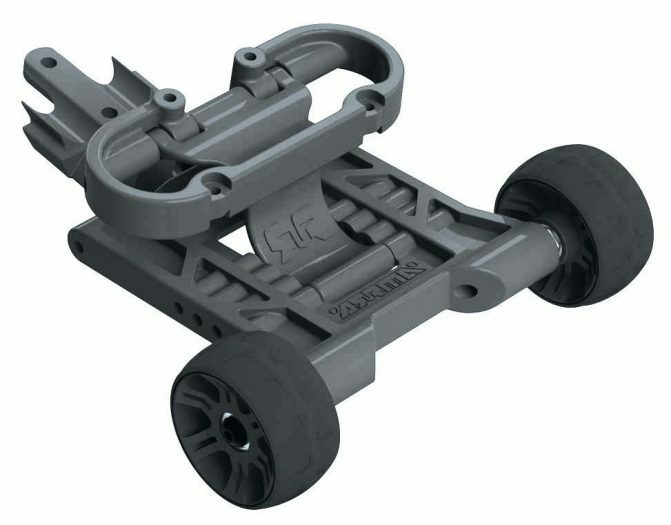 Arrma included a full compliment of tools with the Nero, including five different L-wrenches (especially the REALLY big one for the pillow balls). They also included a very nice 1/8-scale tire wrench for the 17mm hex nuts holding each one of the mammoth wheels on. 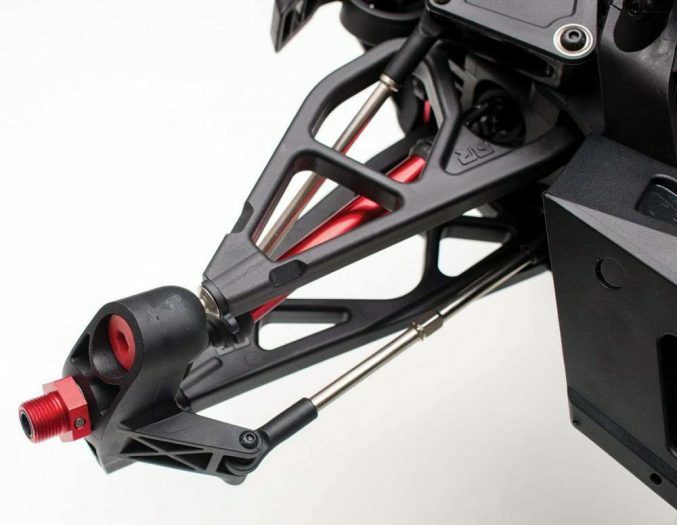 Aside from that, you get the manual and driving mode cheat sheet, a bunch of extra servo horns and shock pistons as well as a spare center skid plate and two XT-90 battery connectors. The manual itself is highly intuitive, clearly outlining all the parts and maintenance procedures, right on down to the estimated time it should take for each process. • Duratrax Onyx LiPo 3S 11.1V 5400mAh 50C Soft Case XT90 (DTXC2004) $89.99 eachGo big or go home, right?! Just because the Nero is able to run on 4S power, it doesn’t mean we have to do it, so we opted for 6S right out of the blocks. 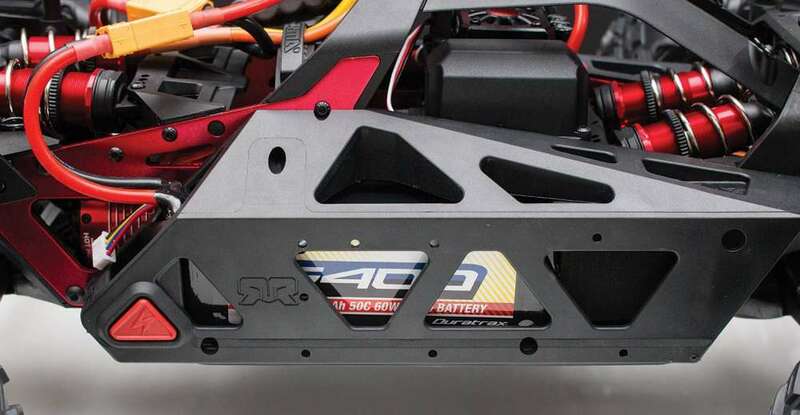 Duratrax provides some of the best cells on the market and these 5400mAh 3S packs will give us the grunt we need to push this beast past the 60 mph barrier. 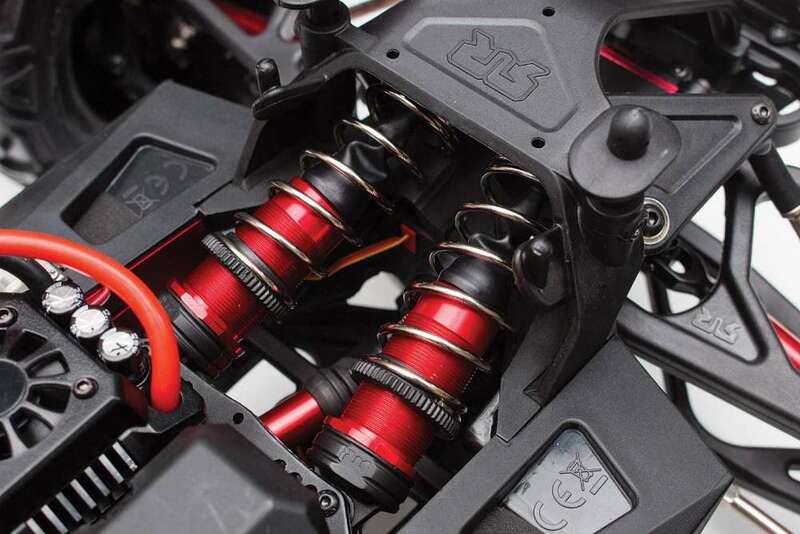 Not only that, but they come with pre-installed XT-90 plugs (which is what the ESC comes with) to keep the power flowing efficiently and get you running in a hurry. • Duratrax Onyx 245 AC/DC Dual Balancing Charger (DTXP4245) $119.99 To compliment our Onyx LiPo packs, there was really no other choice than the Duratrax 245 charger for our needs. This unit has been the staple of the Onyx charger family for a number of years now and the reliability and ease of use are just two of the reasons why we selected this charger. The stock shocks on the Nero come filled with what looks like 30-40 weight oil in them. To custom tune the suspension to your specific liking, we recommend these oils from Associated. You can set it up super soft with some lighter weight stuff or pack the shocks full of 100wt for the ultimate in damping during big air stunts. 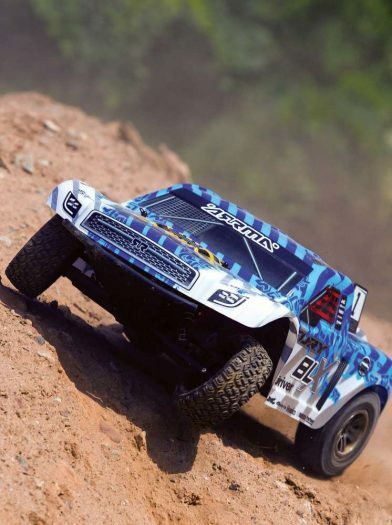 The included body with the Nero BLX has gota killer blue, black and white paint scheme that’s factory applied, but once these machines hit the streets, everyone’s truck is going to look the same. 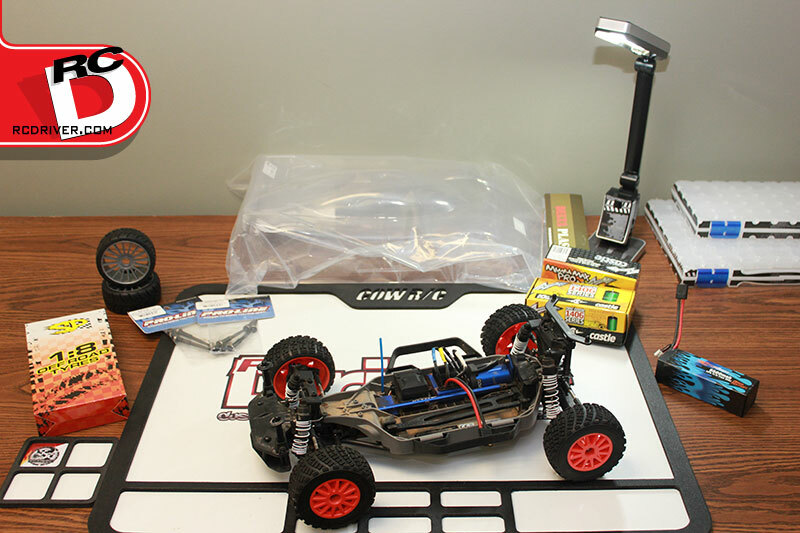 Arrma thought of that and will be releasing this clear Lexan body for Nero owners to custom paint. If popping wheelies is your thing, you might want to think about replacing the stock rear bumper with this wheelie bar from Arrma. In driving mode number two, the truck isn’t just capable of lifting the front tires off the pavement, it will also roll straight onto its back if you’re not too careful with the throttle. This wheelie bar will keep the truck firmly planted with the shiny side up. If you’re using 3S packs, the wheelie bar is almost mandatory. The crown jewel of the Nero BLX is quite obviously the Diff Brain. 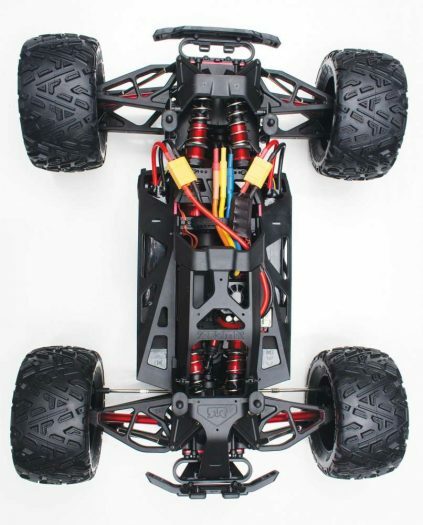 Effectively, this “Brain” transforms the Nero into four different trucks … a general terrain basher and racer in “Blast” mode, keeping the front wheels off the ground in “Wheelie” mode, breaking the rear end loose for Ken Block style driving in “Drift” mode or last, locking up all three diffs for the ultimate in low speed traction for “Climb” mode. The Diff Brain also eliminates the need for a separate channel for each locking servo, combining them all into the third channel available on the Tactic TTX300 radio. 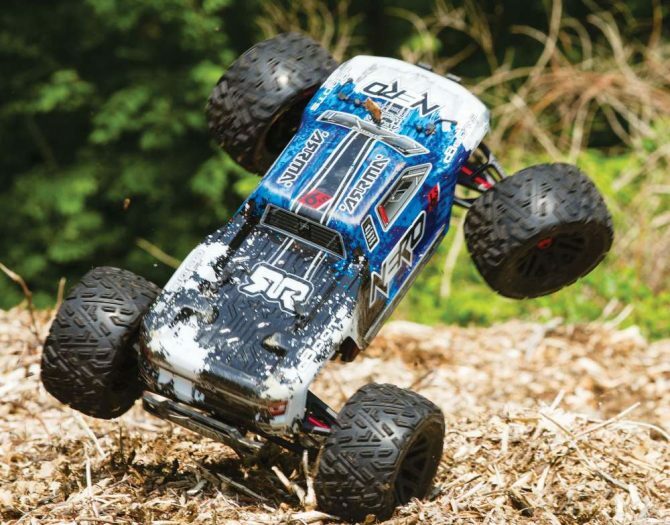 When designing the Nero, the folks at Arrma and Hobbico took their time (seriously, this truck was more than a year in the making). 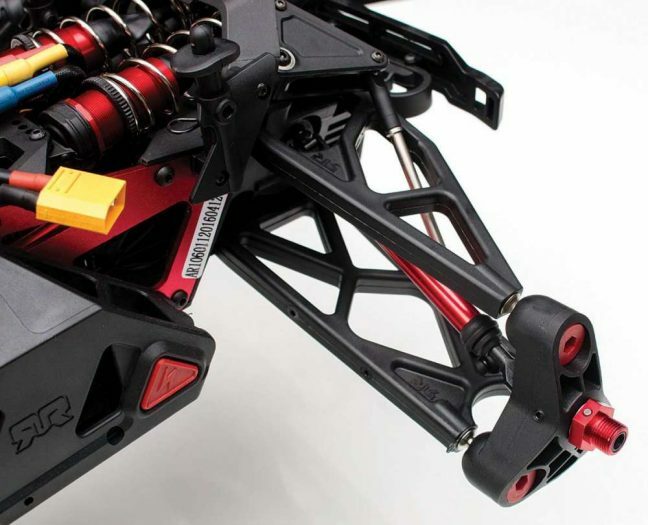 Thelayout of the chassis, joining the awesome red anodized alloy frame plates to the exoskeleton provides a rock solid platform. Additionally, the pillow ball suspension components and arms are huge compared to other 1/8-scale MT’s. 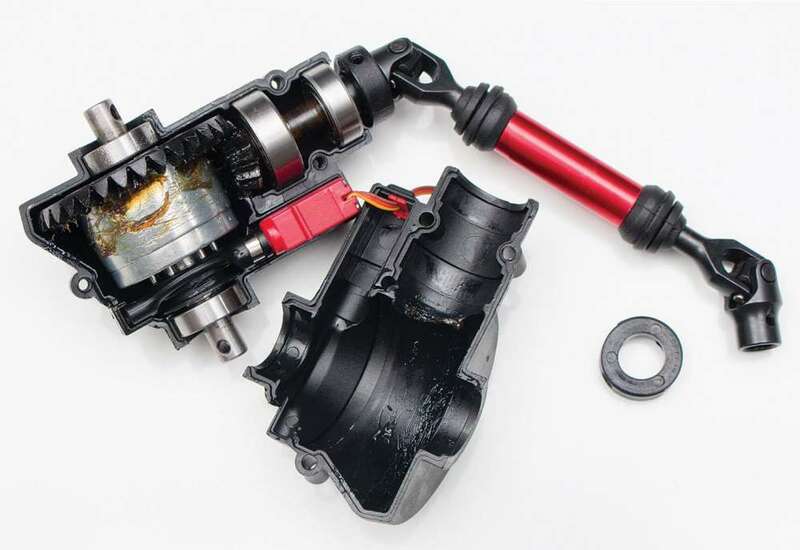 To keep the Nero rolling under copious amounts of torque from the included power system, Arrma manufactured new diff gears that are all steel and are a far cry larger than any previous diffs in their earlier releases. Not only that, but the Nero is very easy to work on. Following the manual, you can remove each diff for maintenance in five minutes or less! • 6S power has become the standard to which all MT bash machines are held these days and the Nero is no different. 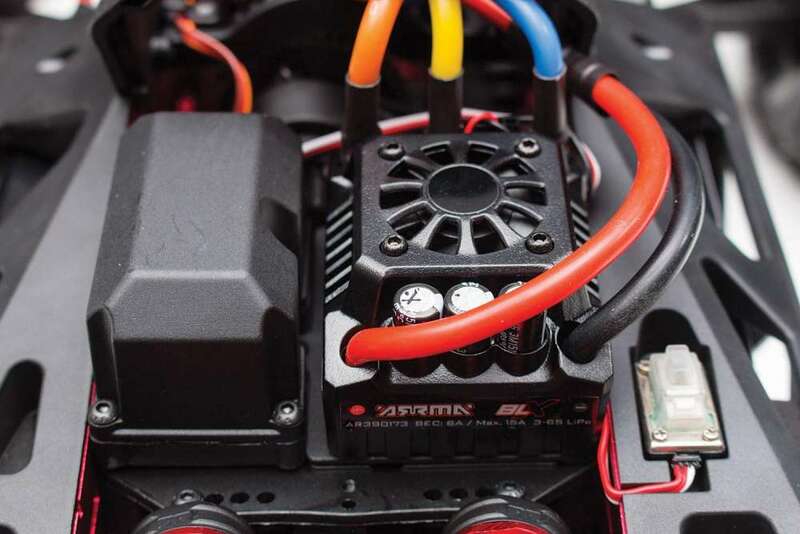 Capable of reaching speeds above 60 mph, the included 2000Kv motor can dole out someserious juice. The 150 amp ESC is fully programmable with parameters such as brake strength, punch power, motor rotation, and BEC voltage as well as thermal overload cut off temperature. Also, the ESC features a built-in cooling fan and is fully waterproof. • While the durability of the Nero was a key factor in its design, the performance of the machine was paramount when the engineers went to the drawing board. The lay-down style shocks keep the beautifully anodized 16mm dampers protected inside the chassis, but also offer a super plush ride and an obscene amount of travel. 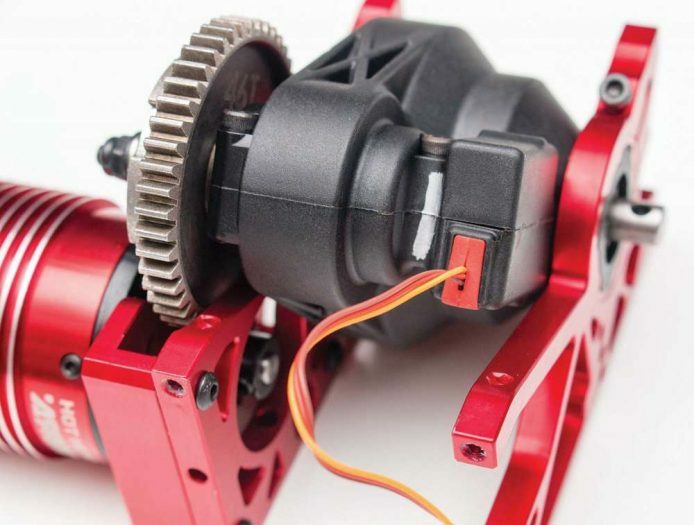 The innovative motor pod that houses the center diff, steering servo and motor is easily dropped out of the bottom of the truck with minimal work. Also, the position of the motor itself is far lower in the chassis than competitors’ trucks, giving the Nero a super low CG. The pillow ball suspension uses a dual ball setup up front and a triple ball out back to eliminate the need for a rear toe link. Additionally, the pillow balls use spacers on the inside for precise camber adjustments. • As mentioned earlier, the ESC on the Nero can be programmed for between 6 and 7.2 volts of BEC power and is factory set for 7.2 right out of the box. Wait, what? 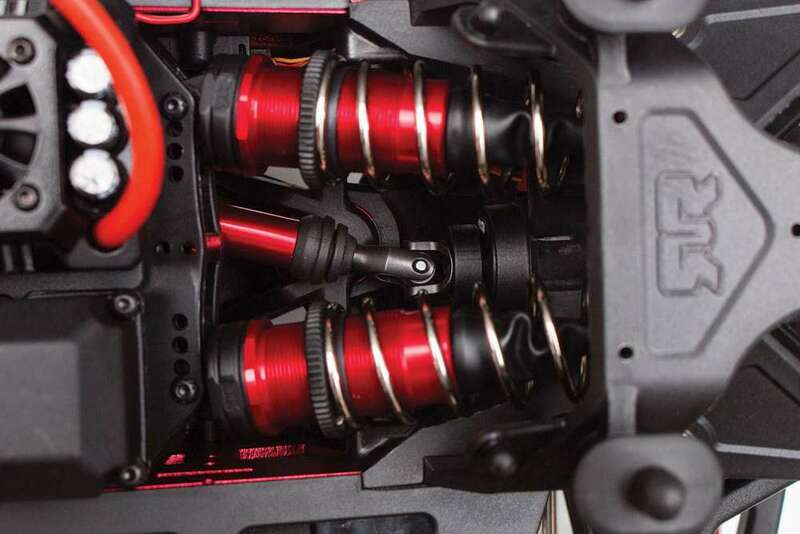 Yep, you guessed it … all four of the servos on the Nero are high voltage models. While the locking servos in the diffs are likely not to be changed, I’m sure that many folks are going to upgrade their steering servos after not long and this ability to run both regular or HV servos means that pretty much anything on the market is going to work. Mucho options is always a good thing. Upon first glance at the Nero when it showed up at our offices, we were surprised to see a single servo assigned to the steering duties. 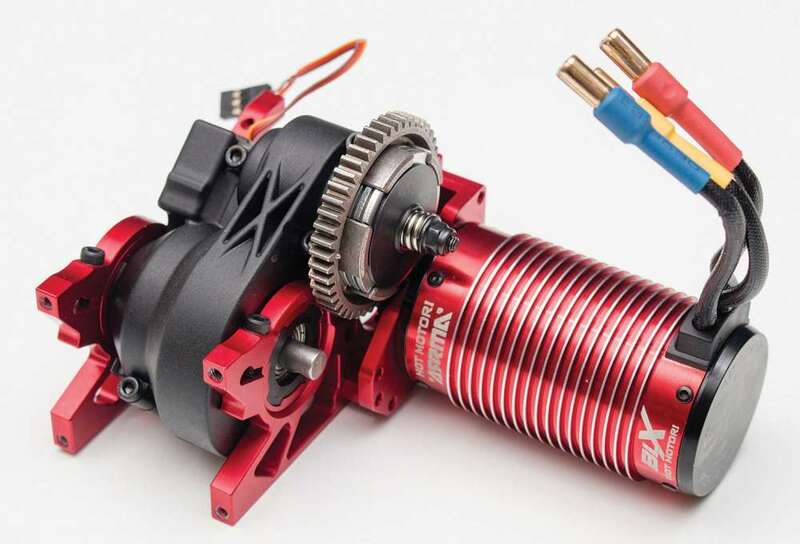 Further investigation revealed that while the Arrma ADS-15MG servo is an HV unit that is waterproof and features metal gears, it only packs just over 200 ounces of torque at 7.2 volts. Still, the Nero has pretty darn good steering authority. In fact, the only time we were left wanting a little more muscle on the single post bellcrank was when we were climbing with the diffs all locked up. In all other driving modes, the ADS-15 does its job nicely and should be sufficient for all but the most power hungry of steering buffs. It’s our belief that the smooth action of the pillow ball suspension offers a resistance-free setup that allows the servo to transfer 100 percent of its power to the steering assembly. 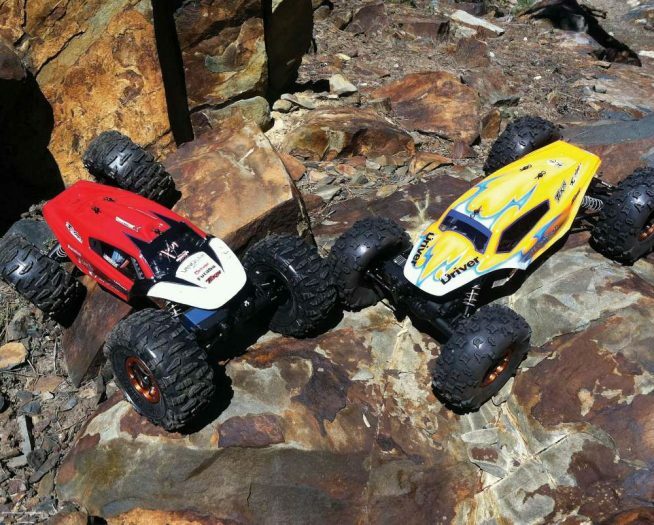 Only under the most extreme conditions, at very high speeds when entering a hard corner, did the servo waiver, but on anything but the stickiest of surfaces, it has great holding power. Of course, with the diffs all locked down in Climb mode, you have to be wary of using too much steering while on asphalt and that you’re also going to be looking at a fairly wide turning radius without the diffs in action. Acceleration with the 3S packs and the ESC in default settings was excellent, especially for a sensorless system. Caution must be applied though when running on high traction surfaces as the Nero will roll straight to its back and then slide … for a long, long way if you grab a fistful of trigger too quickly. In Bash mode, riding wheelies is a little more manageable without the bar out back to keep the nose down. The reason being, the center diff unloads a bit of power to the front wheels off the ground. On 2S, keeping the shiny side up with the front wheels lifted was much easier in Wheelie mode. Before getting our test truck all dirty, we swapped in the larger 17t pinion and gave it a whirl in a wide open parking lot. Again, careful throttle dosages were necessary and once the Nero was up to full speed, it was a blur. The mere fact that the tires were still as big as pizzas at full bore told us that it wanted more gear … but that’s for another day. In stock trim, the Nero exhibits nary a cog on 6S and only slight cogging on 4S at very low speeds. The brakes were a little soft for our test purposes, so we programmed the ESC for a bit more stopping power and were good to go. The ESC also has a reverse delay, meaning you must go back to neutral with the trigger after stopping, before reverse can be used. In Climb mode, the Nero has excellent low speed abilities, especially on the 3S packs. However, we found it best practice to simply place our middle fingers a little higher up on the pistol grip to give the trigger a back-stop. This kept our lead “crawler fingers” from sending dirt and debris into our grinning mouths. EPA’s on the radio would be nice. One of the best features of the Nero BLX is in the handling department. Just looking at it, you know it will perform. 16mm big bore lay-down shocks, plush pillow ball suspension on the end of each set of arms and butter-smooth power transfer from the steel/alloy driveline make the Nero sheer pleasure to drive. Throughout all of our testing, we were continually impressed with how the truck would respond, no matter what situation we put it into. With all the diffs unlocked, cruising over rougher terrain had the chassis of the Nero looking almost like it was gimbal stabilized. The 16mm shocks were just gobbling up whatever we threw at them and 99 percent of the time, the chassis stayed firmly planted. Skying the Nero off of giant BMX jumps, the preload collars needed to be tightened down a bit for the flat landings, but some heavier shock oil will remedy any sort of chassis slapping in such cases. Even when we got a little silly with the throttle on the jumps, a quick yank of the trigger produced multiple back flips, transferring into a level landing stance with a stab of the breaks to stop the rotation landing on anything but four wheels each time. But … each time the Nero would settle onto its paws and continue on. Climbing with the diffs all locked up was a welcome change to blasting, drifting and wheeliing away. The slow speed power delivery is much smoother on 22.2 volts than 14.8, but again, you must be cautious with the throttle. The lay-down style shocks that are actuated through the rockers produce massive amounts of travel, allowing us to put the Nero into some pretty hairy situations. Each time we got it stuck, we simply switched back into Wheelie mode and blipped the throttle to dislodge the truck from the grasp of the rocks and logs. Third only to the innovative features of the Nero and the performance it hands out is the durability of the truck. 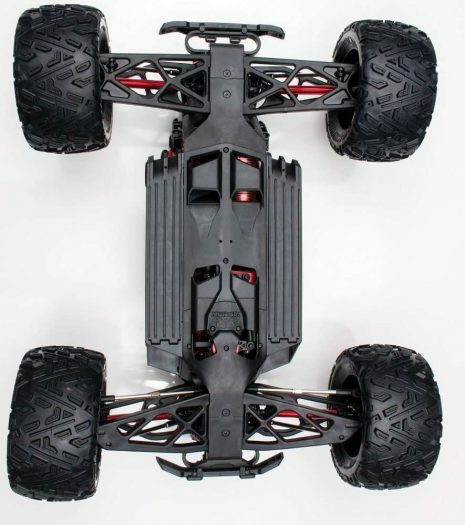 The high-grade alloy used to construct the chassis and motor pod doesn’t only look great, it provides a rigid backbone for the rest of the truck. The composite exoskeleton provides ample protection for the onboard electronics as well as the internals of the truck. The driveline, including all metal gears and the beefy steel drive shafts that key into alloy sliders means you can keep pouring on the power and not worry about anything breaking loose. 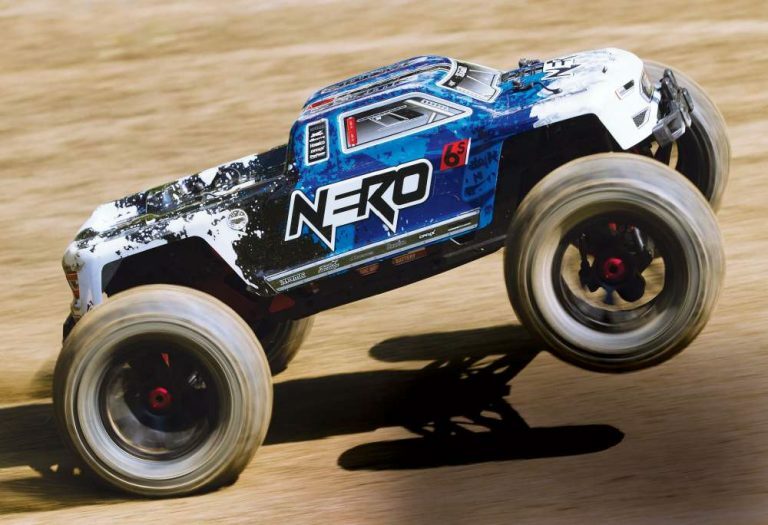 Throughout all of our testing, we sent the Nero tumbling at high speeds, landing on its roof or front bumper after catching some big air and even rolled it in a super deep puddle. Even so, our test truck showed no signs of weakness and kept coming back, ready for more. With the open pinion/spur assembly inside the chassis, we were also worried about debris working its way into the gears, but again, not a single issue through dozens of runs. Even more surprising, the Nero is surprisingly quiet for a huge, heavy truck running steel on steel Mod 1 gears. Toss what you like at the Nero. It will only gobble it up and ask for more. Well, there you have it. The most highly anticipated bash vehicle of the year has hit our store shelves and it’s a beauty … and a beast! 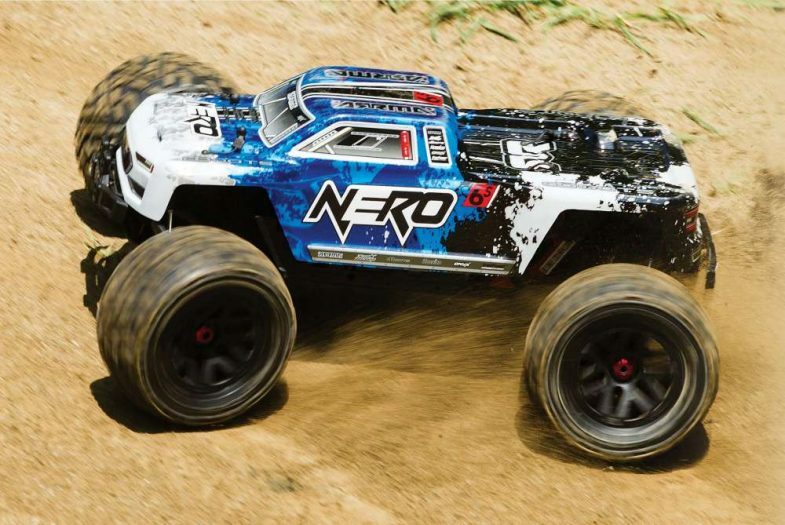 The Nero does really combine the best of four different vehicles into a single platform for tons of RC fun no matter what the given driver is into. Whether your bag is high speed and big air, wheelie popping madness, sideways sliding action or low and slow climbing, the Nero can do it all and do it all extremely well. A pleasant side effect is the fact that the truck just looks plain killer … and that’s with the body off! 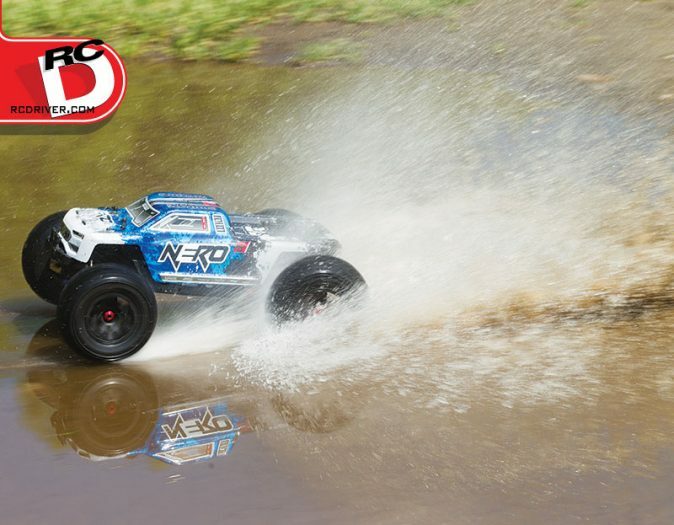 For those of you looking to bash and thrash in a purely traditional sense with an MT, Arrma is also offering up the Nero without the Diff Brain and servos for 100 smackers less than the fully outfitted version we tested. Be sure to stay tuned to follow up articles featuring the Nero and head to the web to check out our video series on this incredible new machine. Next Ask Tony: Hey, I Got Your Answer!